Bone is a key feature of vertebrates. There are different kinds of bone, and other bone-like hard tissues, and it is important for palaeontologists to understand these, especially when they are trying to classify isolated phos-phatic scales and teeth. Bone is made from mineral and protein components. In fine detail, living bone tissue consists of fibres of the protein collagen on which are deposited tiny hexagonal-prismatic crystals ofapatite. Cellular bone is a living tissue. Typical bone contains channels for blood vessels that pass through the structure, and which carry calcium phosphate in solution both to and from the bone. The cells that control bone formation, the osteocytes, are generally encapsulated in the bone as it mineralizes. Vertebrate skeletons clearly have functions in support and protection (if they are partially external, like the shell of a turtle or the head skeleton of an early fish). The internal skeleton that we have is the endoskeleton, and external features, like the shell of a turtle or the bony head shields of early fishes, are parts of an external skeleton, the exoskeleton.As the animal grows, the bones constantly reshape themselves. Bones also act as stores of calcium and phosphorus, and these elements can be mobilized by erosion of the bone, and they can be carried to other parts of the body where they are required. Vertebrates display a variety of hard tissues made from apatite. Dentine,which forms the main volume of our teeth, is very like bone, but it grows in such a way that cells are rarely encapsulated within the mineralizing tissue. Dentine contains narrow tubules in a zone between the centre of the tooth, the pulp cavity, and the surface, just below the enamel. Enamel is another hard tissue found in our teeth. It is largely inert crystalline apatite with some structural proteins, but with no collagen or blood vessels in the structure. The first vertebrates had bone that developed from different parts of the early embryo, some from deep sources, the endodermal bone, and some from more superficial sources associated with the skin layer, the dermal bone. Endodermal bone is seen in Anatolepis and thelodonts. 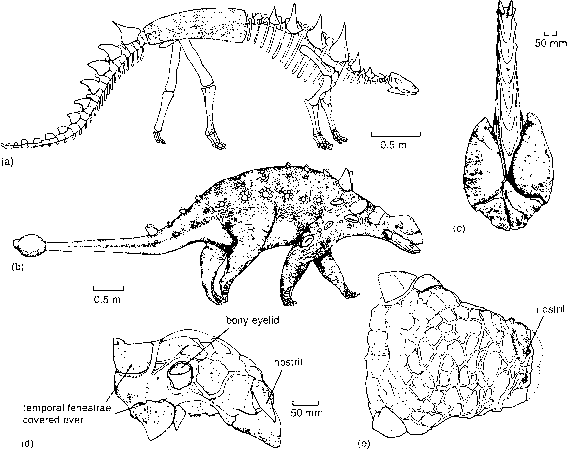 Dermal bone is seen possibly in Anatolepis (Figure 3.2), which had scales made from dentine, containing dentine tubules (Figure 3.3(a)), but with no sign of enamel (Smith et al., 1996), whereas the first conodonts had enamel and dentine. These astonishing observations show that the dermal plates of early vertebrates had more in common with our teeth than with true bone. 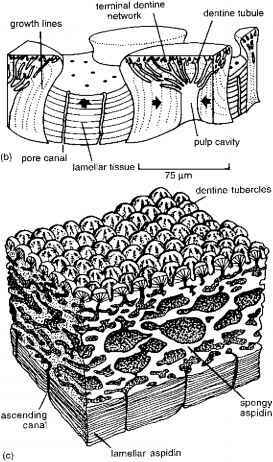 The tubercles on a dermal plate of Anatolepis are like individual teeth, made from dentine, and with a pulp cavity inside each of them (Figure 3.3(b)). Incremental growth lines can be seen within the dentine, showing how the tissue was laid down as the animal grew larger. Between these tooth-like tubercles is a lamellar, or layered, hard tissue containing pore canals, perhaps containing nerves for sensing movements ofpredators or prey in the water. Later vertebrates also had dentine tubercles on the outer surface of their dermal bone, but deeper layers were more complex than in Anatolepis. Beneath the dentine tubercles lay a thick middle layer of spongy bone, and beneath that a laminated layer of compact bone. 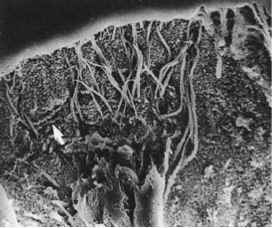 Both layers are acellular: they lack osteocytes. Tooth-like outer bone coverings are found in many fossil fish groups, and sharks today have pointed scales made from dentine and enameloid all over their bodies. Certain early armoured fishes had a complex bone of this kind called aspidin (Figure 3.3(c)). The earliest vertebrates had unmineralized internal skeletons, perhaps made from cartilage, which is a flexible material consisting mainly of collagen. The cartilage of these earliest vertebrates though was not composed of collagen (Donoghue and Sansom, 2002), as is the case also in lampreys and hagfishes. Cartilage makes up most of your nose and ears, and the cartilaginous fishes, sharks and rays, retain an internal skeleton made entirely from that material. At some point, possibly as the endoskeleton came into contact with the ex-oskeleton (induction),bone began to appear in internal skeletons, particularly in the head region, usually first surrounding, and then invading, cartilaginous structures. Perichondral bone forms by crystallization of apatite to form acellular bone around soft tissues such as nerves that pass through cartilage, for example, in the braincase. It is also found in the girdle bones that support the fins of fishes. Endochondral bone forms as a more substantial replacement of cartilage. Endochondral bone appeared in later jawed fishes, and it forms most of the skeleton of land vertebrates, which require additional internal support. In human babies, large parts of the limb bones are made from cartilage, and during growth these ossify, or turn into endochondral bone by the deposition of apatite. The fontanelle, the diamond-shaped opening on the top of a baby's skull,is a cartilaginous zone that ossifies as the parietal and frontal bones fuse. What are the different bone tissue of vertebrates? Does the amphibians teeth have layers of tissues?